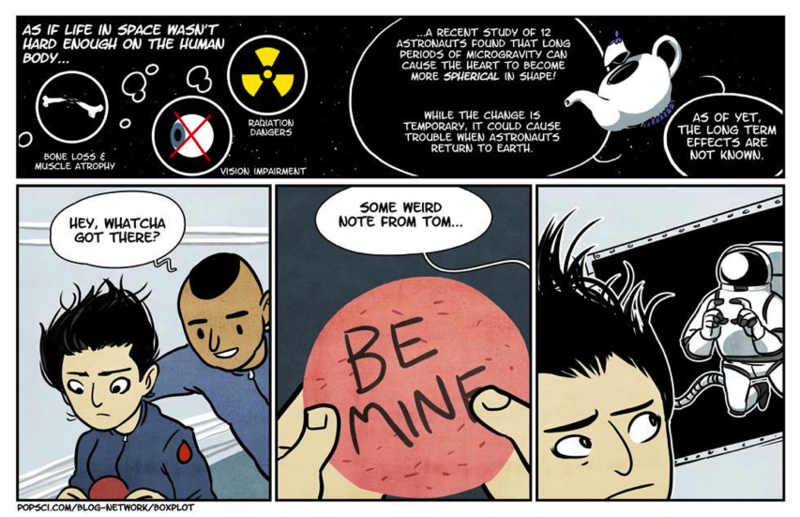 Zero Gravity Make The Human Heart More Spherical #SaturdayMorningCartoons « Adafruit Industries – Makers, hackers, artists, designers and engineers! Microgravity, which seems like zero gravity, but is actually a state of free-fall caused by a spacecraft’s orbit around the Earth, has long been known to wreak havoc on the human body. Without having to support the weight of the body, bones begin to lose density and muscles atrophy, requiring astronauts to exercise regularly to stave off the effects. Without gravity to pull fluids downwards, astronauts often experience a phenomenon colloquially known as “puffy-face-chicken-legs syndrome”. More recently, this increase in fluid around the brain has been linked to changes in astronauts’ vision. Fluid shift has also been blamed for a diminished sense of smell and taste. Now, a study presented at the American College of Cardiology’s 63rd Annual Scientific Session has added possible heart troubles to that list. The study, titled “Affect of Microgravity on Cardiac Shape: Comparison of Pre- and In-flight Data to Mathematical Modeling” showed that like most things in space, the human heart can become more spherical during long-term space missions. The heart, like other muscles in the body, is susceptible to atrophy because it does not have to work as hard in space. So it is important for scientists to develop effective ways for astronauts to maintain proper heart health. In the study, twelve astronauts took ultrasound images in order to monitor their heart health before, during, and after their mission. What they discovered was that their hearts became more spherical by a factor of 9.4%. The good news is that the effect is temporary, and may actually provide useful data in treating heart conditions here on Earth that effect the heart’s ability to pump blood.